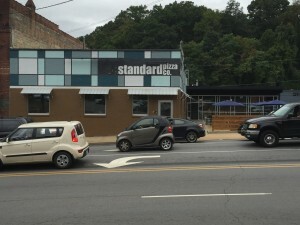 Friday Night Kick-off Party - Standard Pizza Co.
Kanopi Studios is proud to host the Saturday Evening After Party at Barley's Taproom downtown Asheville. With over 100 local and craft beers in stock this original location of Barley's meets the needs of any beer enthusiast. The food is a mixture of Italian and American Pub with pizza, lasagna, burgers, and sandwiches. Justin Rhodes, an Asheville native and Kanopi Studios employee will be on hand to offer suggestions from the menu, *Spoiler alert* Garlic Knots and the Meat Eater Pizza! The gathering will be hosted on the top floor of Barley's Taproom, this is a 21+ Space. If you intend to bring your family, there will be several people getting tables on the main floor to accommodate family groups, then feel free to pop up to the top floor to mingle when convenient. Kanopi Studios will be providing a bar tab so your first drink is on us! You will only be able to get your free drink upstairs. Parking is available beneath the Aloft hotel across the street from Barley's. Super easy! This is a beautiful, gently sloped trail that is very accessible, and perfect for kids and family! The major water crossings have bridges, and you won't need waterproof boots to traverse the minor creeks that flow across a couple spots on the trail. For the hard-core seasoned hiking vets, there is another waterfall further up the river, but that trail is extremely technical and can be very dangerous. Our guide is open to leading a group of us to the 2nd waterfall, but only upon request. Only the coolest, most adventurous, radical-est attendees of DCAVL 2017 and their friends and family! We will meet at The Dripolator in Black Mountain between 10 - 10:30 am to get caffeinated and convoy over to the trailhead. If you don't want coffee, wake up late, or would prefer to go directly to the trailhead and meet us there at 11am. Here are some alternative directions in case the interwebs fail you. Head East on I-40 to Exit 73 for Old Fort. Immediately after exiting the interstate, hang a hard right onto Catabwa River Road. It is a 2-lane road that ends at the parking area for the hike, so drive until you can't drive anymore. A great attitude, a Drupal shirt (if you have one) for a photo, a camera, some water and any snacks or lunch you want to eat. If you want to go swimming, bring a swimming suit and a towel! Our guide has offered to carry everyone's water, Drupal shirts, and snacks, so you don't even need a backpack if you don't want one! A quick note for pet owners: This is a pet-friendly area, but local laws require your pet be on a leash. This hike can get busy sometimes, so keep that in mind when considering bringing your animals!